"Arthur Bishop (Statham) thought he had put his murderous past behind him, until his most formidable foe kidnaps the love of his life. Now he is forced to travel the globe to complete three impossible assassinations, and do what he does best: make them look like accidents." So first up, act one is pretty much a quick action scene showing us Arthur's skills. He makes a get away to hide on a remote vacation island. He ends up saving a girl who was in trouble and they hang for a few days or so. (Alba) Suddenly, she somehow becomes the love of his life. The fling was so fast, I didn't realize she was the love of his life until I read the synopsis. Each kill Arthur was given to execute, which would have taken someone weeks of planning and weeks to infiltrate, takes Arthur a day each at most, so the believability of each scene is stretched pretty thin. If you're a Tommy Lee Jones fan, just skip to the third act, because that's when he first shows up for his five, maybe ten minutes of on-screen time. 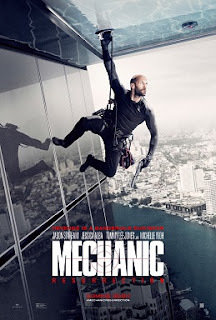 So overall, it's a pretty weakly constructed action film to the extent that it felt like they barely put any effort into it. IMDb users gave it a 5.7/10 score. Rotten Tomatoes, 31%. 1 point for having Statham in it. I'm a fan. 1 point for having eye candy Jessica Alba in it. 1 point for having the prerequisite Alba bikini scene. Statham's usual action portrayal seemed restrained, Alba seemed to barely mail it in, and the bad guys almost made the film feel better. If I didn't know any better, they were trying to kill the fanchise with this film. So save yourself the time. It's not even bad enough to have fun with.